Aquarius Refrigeration & Home Air Conditioning are here to help you decide which system is right for your home. Servicing all areas of Brisbane and the Sunshine Coast for new air conditioning installation, air conditioning servicing and also 24/7 emergency callouts. Contact us now! Get the best and most efficient air conditioning for your home with our professional home air conditioning installation services. We offer full installation and maintenance of high-quality air conditioning systems, helping you get the most effective solution for keeping your home cool and comfortable every day. Whether you need air conditioning for a single room or an integrated system for your entire home, our team will find the right solution for your needs and budget. We provide home air conditioning installation Brisbane wide as well as all suburbs across the Sunshine Coast, helping homeowners across South East Queensland get the air conditioning systems they’ve always wanted. 1. Split System Air Conditioning. This air conditioning system is a popular option for cooling multiple areas in a typical home. It’s one of the most cost-efficient air conditioning systems, providing consistent and reliable cooling for well-defined areas in your property. Our split system home air conditioning systems include options for reverse cycle air conditioners (which provides heating and cooling) as well as inverted air conditioners. 2. Multi Split System Air Conditioning. This is an advanced variation of the split system air conditioning system, providing the same multi-room cooling capacity but with a different setup. A Multi-Split System connects multiple indoor air conditioning units with a single outdoor unit, making it ideal for those who have limited space for outdoor units. It offers greater control and flexibility for home air conditioning, allowing you to set temperatures differently in every room while making the most out of your available space. 3. Ducted Air Conditioning. Ducted air conditioning uses a single system for controlling the temperatures in different areas in your home. This system offers the simplest way to manage temperature in several rooms, allowing you to change settings and control airflow from a single central system. Our ducted home air conditioning solutions include options for reverse cycle systems, which provide both warm and cool air for different seasons. Not sure which type of home air conditioning is perfect for your home? Consult our team to find out what’s right for you. 1. 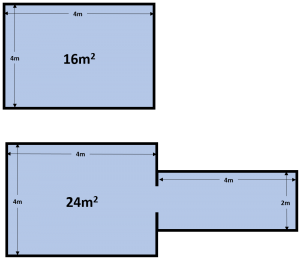 First, you need to find out the size of the area in square meters (m2). Make sure you consider any hallways or rooms which you cannot seal off. 2. Once you know how big your area is, use the table below to decide on the right air conditioner for you. Remember that this is only a general guide for determining the right size of air conditioning for your home. Don’t forget that large windows, heat loading, ceiling heights, and room use all play a part in calculating what air conditioner size would work best for your property. If you need more help determining the right size of air conditioner for your home, chat with our AC installer to find out more. Getting the right sized air conditioner is more important than you might think. In most cases, getting an air conditioner that’s a little too big is better and more cost-efficient than getting one that’s too small. Having a system that’s too small can shorten the life of your air conditioner since it needs to work harder to heat or cool your room. Air conditioning for your home that’s too small also means that it will take much longer to reach the temperature you want – or perhaps never get there at all. Your power consumption will also rise with a system that’s too small, which means any savings you made on the initial cost of purchasing the system will eventually be outweighed by an increase on your electricity bill. General Climate. Do you live in an area that experiences extreme temperature shifts? How hot (or cold) does it get in your neighbourhood? Knowing the general climate in your area will help you determine what kind of air conditioning system is ideal for your home and whether you need reverse cycle systems for your property. Amount of Use. Are you planning to use your air conditioner only when temperatures rise or drop uncomfortably? Or will you be using it every day to make your daily life at home more comfortable? Your frequency of use and how you use it can help you determine the power requirements you need from your air conditioner. Talk to our AC installer if you need more advice and recommendations. Features. Do you want in-depth control of your air conditioning system? Or are you looking for home air conditioning that you can simply turn on and forget about the rest of the day? Considering what features you’re looking for (eg. sleep mode, timers, etc.) can help you determine what type of system is right for your home. Ready to make your home feel more comfortable with the right home air conditioning unit? Call 07 5493 3691 or get a quote to get started. Whatever type of air conditioning system that you need, you can trust our AC installer and technicians to set it up properly for you.